Exhibition opening Saturday 24th 17:00. Could the political or social environment we operate within and the challenges we encounter lead to new ways to produce and exhibit art? The symposium and exhibition project Interim Days: Tbilisi is created with the intention to act as a networking platform for artists and cultural producers from different social and cultural contexts. The main goal is to find opportunities to develop international collaborations and to establish new initiatives that involve transnational cooperation, including eastern European countries. The point of departure is the perspective of the participants, where the experience of being an artist becomes predominant and tells wider stories, about society and the possibilities for art to exist in different contexts. The participants come from Sweden, Georgia, Republic of Moldova and the Ukraine, but there are also participants from other countries with experience from artistic practice within these regions. The discussion will focus on what separates the different contexts when it comes to the possibilities for art to exist and to the hardships and opportunities that follows. The perspective, in this case, always comes from the artist. 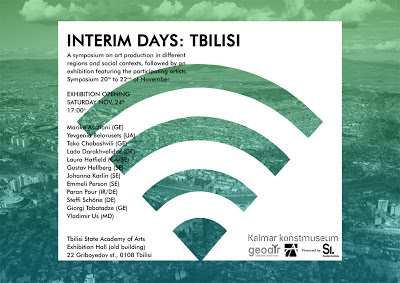 The symposium is collaboration between Kalmar konstmuseum and GeoAIR with financial support from the Creative Force programme within the Swedish Institute and generous support of Tbilisi State Academy of Arts. Kalmar konstmuseum as well as GeoAIR has a well documented experience of being a part of international projects. Symposium and final presentation of works produced as a result of five days intensive exchange between participants will take place in the big exhibition hall of Tbilisi State Academy of Arts. Exhibition opens Saturday 24th 17:00.